An engineered hardwood floor is not solid hardwood. The top layer is finished real wood so that you get the look and feel of a hardwood floor. 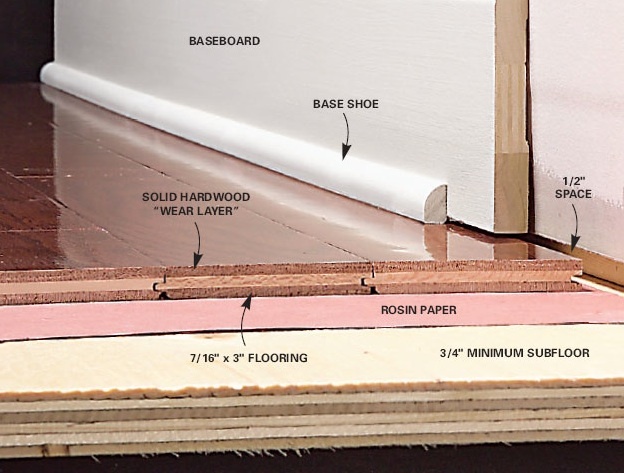 The bottom layer, or core, is made up of stacked layers of fiberboard or plywood. The benefit is that the core will expand and contract according to humidity levels in the air so as not to cup or warp the top layer of solid hardwood. This makes engineered wood flooring great for basements or other damp areas in a home where one might not normally install solid hardwood due to possible moisture issues. Many types of engineered wood floors can be floated or glued down. In this way, installation is easier for the do-it-yourself consumer. The top layer is already sanded and sealed. Therefore, once this flooring is installed, it can be walked on and used immediately. Engineered wood can be sanded a limited number of times (Usually 1 - 3, depending upon thickness) to remove dings and scratches. I recommend hiring a flooring professional to sand the floor as it can be easily damaged to reveal the plywood beneath. Engineered wood flooring is durable on the surface. It is slippery and often sounds hollow when walked on. There are many types of engineered wood and ways to install it. You get what you pay for, though it is almost always more expensive than laminate. Certain styles can be removed from the home, if you are moving for example, to be installed in another location.